I don't have access to a lot of props around here... this is a crate with a wooden box frame on it that sits in front of my living space. The rocks were carefully gathered from the ground, which is conveniently covered with 'em. Hopefully at least a few folks will get a chuckle out of this. And for those that missed it - "Think outside the box"
Apologies to Neil - I did try it with a different font but couldn't get it the way I wanted it in time to enter. So glad to see this was from a TSer! Gave it a ten - not just a great idea but a great shot - excellent use of angles and shadows. Deb, this was one of my higher rated shots. I think it is magnificent. The idea was brilliant! AND IMO should have rated much higher. Great concept....I agree that "THINK" could have been more effective a little larger. Still a great idea and execution. An underrated shot Deb! But I like the one post's comment that this should be the DPC poster (and t-shirt). I agree! ah, this was yours! great idea, i really liked this one. i jsut wish the 'think' had been a little bigger - not a lot, just a smidge. "Think outside the box." -- Cool. very creative Deb. You do great even when stuck in a desert. I couldnt think of anything for this and i am not in the middle of a desert. i really like the lines and textures you created . Lovely abstract with surprise message. Oooh it's like a Zen photo. I would like to have seen "think" a little more spaced apart. The shadows kind of run the letters together. I wish I could vote on this Deb. Ha! I didn't notice that the rocks said "think" when we discussed it in the Critical Mass team thread. I hope it's getting appreciated! Neat, I like the idea. Good comp, think it needs more contrast. Deserves a high score, and gets one from me. It is clever even though literal, and certainly elegant and well executed. I hope your reward doesn't require waiting for an OOBIE. Site council should consider licensing this from you to use on DPC T-shirts (in spite of common voting patterns to the contrary) or as a screen-saver. great idea, very creative. i like this alot, if the letters in the stone were a little bigger i would have loved it! Excellent idea and interesting POV / composition. Deb, I hope folks take the time to see this one. Great composition, and use of the angles. And good job getting the exposure. I would've given this an 8. 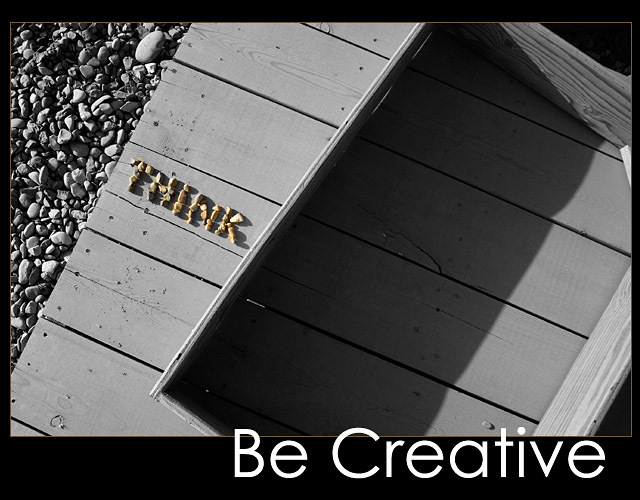 This might be even better with title "Be Creative - Think out of the box", but maybe that's implied. If so it's too subtle. Nice, I like everything about this. I like the way you're thinking here. A poster that requires a little thought and analysis is a good poster in my book. Your "Think" needs to be more easily read/bigger rocks? Love the concept and the rest of your composition. very nice idea, good composition and layout. "Think" is hardly readable because of the strong shadows. Proudly hosted by Sargasso Networks. Current Server Time: 04/20/2019 12:28:08 AM EDT.